A Website, or Web site, is not the same thing as a Web page. Though the two terms are often used interchangeably, they should not be. So what's the difference? To put it simply, a Web site is a collection of Web pages. For example, Amazon.com is a Web site, but there are millions of Web pages that make up the site. BusinessDictionary.com describes a website as a “virtual location” that’s accessible via unique URLs and an internet connection. It’s kind of like your house. It has a street address that people can find using roadways. If they have a GPS, they simply plug in the address and are given a direct path to your house. Your website is your virtual home. Rather, it’s your virtual place of business and must be ‘findable’ and accessible. The URL is your address. And, rather than physical streets, people find you through virtual roadways in cyberspace. And, they find you within seconds. The website is a critical part of every online platform. In fact, it’s fundamental to your platform and your content marketing (and inbound marketing) strategy. Because of this, you need to generate visibility and traffic to that site. Well, there’s so much ‘noise’ (competition) in cyberspace it’s very, very, very difficult to cut through it. The internet is teeming with websites, information, and searches. And, if you’re promoting or offering anything, you must have an optimized platform that includes an optimized website. There is no way around this fundamental fact. To get your small or home business moving in the right direction, you also need to take advantage of inbound marketing. This marketing strategy includes: content marketing, email marketing, and social media marketing. I’m offering a NEW 4-week, interactive e-class for 2015 through WOW! 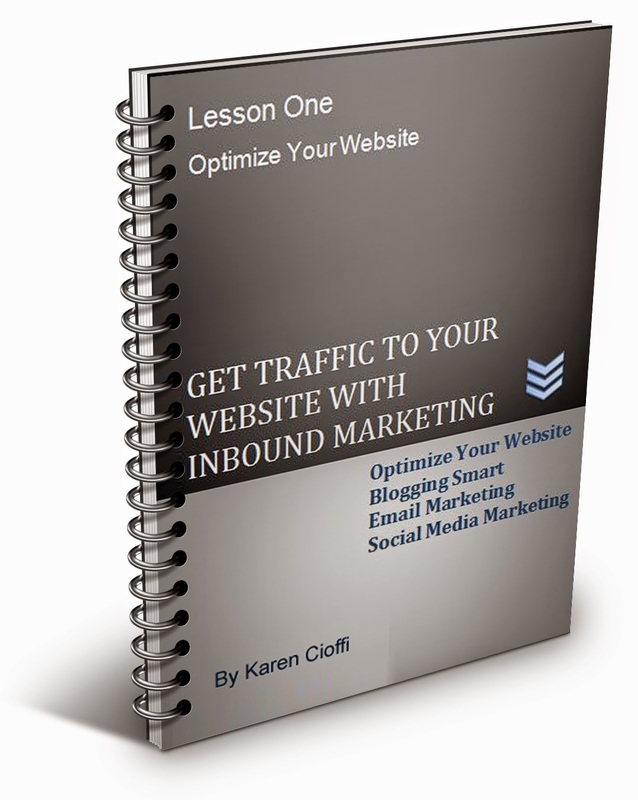 Women on Writing, GET TRAFFIC TO YOUR WEBSITE WITH INBOUND MARKETING: Website Optimization, Blogging Smart, Email Marketing, and Social Media Marketing. It's priced right, so be sure to CHECK IT OUT TODAY (just click the link right above).